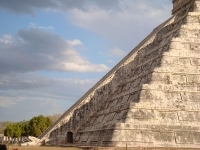 Equinoccio de la Primavera, the Spring Equinox, draws thousands of people from around the world to witness the shadow that seems to crawl down the El Castillo pyramid in the Chichén Itzá temple complex. The shadow represents the snake god, Kukulkan and takes the form of a giant, slithering snake that slowly descends the stairs of the largest Mayan pyramid in the country. Sunlit triangles appear to work their way down the stairs, finally illuminating the snakehead at the bottom and forming the giant sunlit serpent. The spring equinox is celebrated by many cultures in many countries, but the Mayan ritual is one of the oldest and most famous, particularly as the pyramid is associated with brutal human sacrifices. The archaeological site of Teotihuacan, near Mexico City, is also a favourite spot to celebrate the arrival of spring and thousands of travellers visit the site for the equinox, traditionally dressed all in white. The Mayans were famous for their advanced use of calendars, making this an apt national celebration. Festivales de Primavera, spring festivals, are still celebrated all over Mexico, commonly with children's parades where participants dress up as flowers or animals to welcome the season of fertility and rebirth.